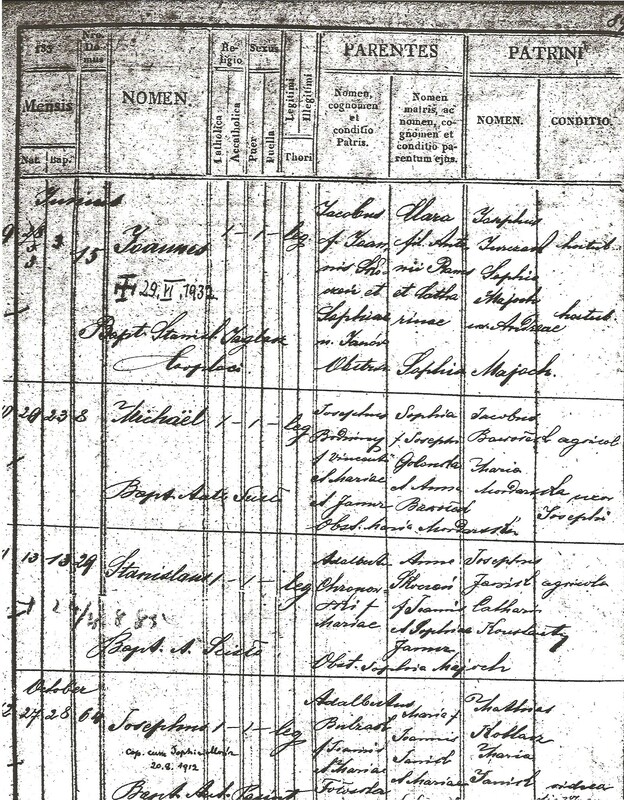 Through FamilySearch.org's online search engine, I was able to find an indexed record from the nearby town of Brzezna, Poland that was likely Sophia's baptism record. 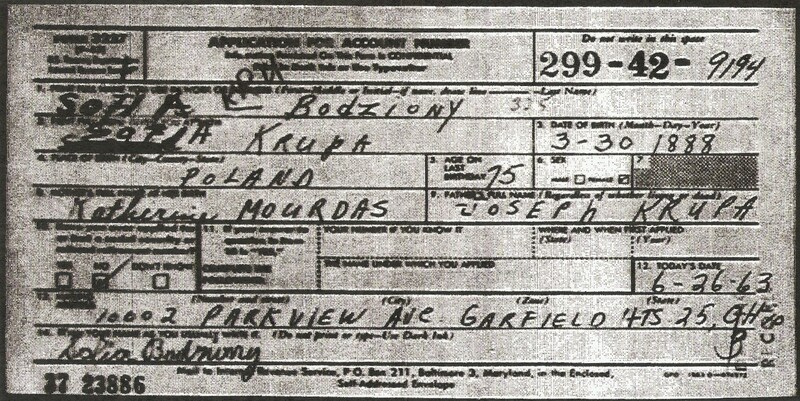 I confirmed that it WAS her baptism record when I was able actually look through the microfilm and found Sophia's marriage record to Michael's dad, Joseph Bodziony (also in Brzezna), in which her parents are also listed. Fortunately, the Golonka family had been in Brzezna for a few generations, so I was able to use the same microfilm to trace back that line to Sophia Golonka's grandparents, Thomas Golonka and Petronella Iwanszczonka (or Iwanska), who would be my 4x great-grandparents! Not bad considering that I started out my genealogy journey not even knowing who Michael's parents were! According to that site, there are about 4,400 people in Poland today with the surname Golonka, so it's not terribly common. You can see that there is a heavy concentration of the name in southern Poland, in an area that was called Galicia when my great-grandfather was born. In fact, Nowy Sącz County, where both Świniarsko and Brzezna are both located, has the second-highest concentration of the name, behind the county of Limanowa, which is just to the west. A native Polish speaker also suggested to me that the name might carry the meaning of shaving or of being shaven. The Polish verb for 'shave' is golić, so the surname might have the same root. Family members, the link to the new and updated Golonka ancestor page is here. The link to Michael Bodziony's paternal Bodziony ancestors is here. I am still working on acquiring some additional records, so check back and let me know if you have any questions! The surname could possibly be a reference to a place name. There is a town by the name of Bodzanów about 70 kilometers to the northwest of Świniarsko. (There are actually several villages with this name around Poland, but this one is the closest.) There is a also a town farther away in Świętokrzyskie Voivodeship, (north of Małopolska Voivodeship) known as Bodzentyn, which has been around since the 1300s. So, it's possible that the family name originated as a way to tell other people "this family is from Bodz... village." My great-grandmother, Sophia Krupa, immigrated to America in 1910 and married my great-grandfather, Michael Bodziony in November 1911. According to her naturalization papers, she was born in Skrudzina, Poland, a small town that was, at the time of her birth (1888), part of Austria-Hungary. When I first learned of her birthplace a couple of years ago, I went to FamilySearch.org to see if they had a microfilm that covered this geographic area and time frame. I saw that they DID have microfilmed records for Skrudzina, but I did not order the film at the time because I had no time to go to my Family History Center and look through the reel. So instead, I ordered a copy of Sophia's application for a Social Security number. Since this form was filled out directly by Sophia herself, it's first hand knowledge of her birth date and parents' names. On it, she lists her birth date as 30 Mar 1888, which is exactly the same birth date as what is listed on her naturalization documents. Her parents are listed as Joseph Krupa and Katherine Mourdas. She was illegitimate and no father is listed. Her mother was Catharina, daughter of Jacob Krupa and Mariae Kotodziej. Also, Catharina lived in House #51, which is where Paul Krupa and Sophia Hejmej also lived at the time. Paul and Sophia Krupa were likely related, but how? And were there any other Krupas living in Skrudzina (other than those of child-bearing age)? I need to order the microfilm and look through the whole thing carefully. I did a quick search of Jacob Krupa and Mariae Kotodziej, and found six indexed baptism records for their children, ranging from 1843 to 1865. However, none indicated the name of Catharina or Paul. The family lived in Obidza, Poland, which today is just a 20 minute drive from Skrudzina. These records are on a different microfilm, so I have a feeling I'll be ordering that one, too. Did Sophia live her life believing that her parents' true names were those she listed on the Social Security application? Perhaps she was raised by the Joseph and Catharine Krupa in House #16 and she genuinely thought that they were her biological parents. Or maybe she knew the complete truth. That's probably something I'll never find out, but hopefully ordering these microfilms will help me learn more about her mother and the other families in Skrudzina and Obidza. When I was first starting my family tree research, I ran into a bit of a roadblock when searching for information related to one of my paternal great-grandmothers. At first, all I knew was that she was a Polish immigrant who lived in Cleveland, and who died when my grandfather was a young child. All my dad and his siblings knew about her was that she went by 'Lottie.' I was able to piece together some clues through other family documents I found: I knew she had died by 1920 because my great-grandfather was listed as "widowed" in the 1920 census. My great-uncle's obituary listed her name as "Lottie Gacka," so all right, I thought, now I have her maiden name. I searched the engines on various genealogy sites for Lottie Kowalski (her married name) and Lottie Gacka, but I couldn't find any records that I could definitively link to my great-grandfather. In fact, as I was scrolling through the many records returned by the search engines, I soon realized that 'Lottie' was a common nickname adopted by Polish immigrant women in the late 19th and early 20th centuries. So, at this point, I feel like my only choice is to scroll through and check ALL of the records returned by the search engines, even those with names that would not initially seem to be a match, in the hopes of discovering some clue that would lead me in the right direction. I was doing this on FamilySearch.org and came across a 1919 death record for a woman by the name of 'Władysława Kowalska.' The record also listed her father as 'Stanisław Gacki.' Hmmm, 'Kowalska' and 'Gacki' are close to 'Kowalski' and 'Gacka,' but, again, I had NO idea if this really was her first name, so I couldn't be sure it was her. I printed it out, though, and hoped that it may be an important clue. "Ohio, Deaths, 1908-1953," index and images, FamilySearch (https://familysearch.org/pal:/MM9.1.1/X8L9-NC9 : accessed 04 Nov 2012), Wladyslarva Kowalska, 1919; citing reference fn 52304, Ohio Historical Society, Columbus, Ohio. And there he was at the bottom - Informant: Dominik Kowalski - my great-grandfather. Now, I KNEW without a doubt that it was her. And then I was a tad angry with myself for not realizing that Poles traditionally spell surnames differently depending on if you are a man or a woman. I have read enough Dostoevsky and Tolstoy in my life to know that this is true in Russia, but I suppose I had never been exposed to it as part of Polish culture. This explains the 'Kowalska' instead of 'Kowalski' and even the 'Gacka' instead of 'Gacki.' Even though she had been in America six years, she maintained her female surname, even if she did adopt a more "American" first name. Source Citation: Year: 1912; Arrival; Microfilm Serial: T715; Microfilm Roll: 1850; Line: 8; Page Number: 76. Source Information: Ancestry.com. New York, Passenger Lists, 1820-1957 [database on-line]. Provo, UT, USA: Ancestry.com Operations, Inc., 2010. Because she died quite young, these are the only two documents I have found that reference Władysława. I am still on the hunt for her immigrant ship manifest; she came over about a year after my great-grandfather with her three sons ages four, two, and eight months. (I can't even imagine doing that on my own - she was obviously a very brave, a very strong woman.) By the way, the name 'Władysława' is the female equivalent of Władysław, which comes from the Russian name of Vladislav. It means "to rule with glory." Ok, so literally right after I typed that sentence above about being on the hunt for her immigrant ship manifest, I went to Ancestry.com. Because I knew she was traveling with her sons, I tried searching for the manifest using the name 'Jan Kowalski,' who was her eldest son. I had previously discovered his immigration application papers, so I knew the exact date they entered the country and the ship name. I had to scroll through quite a few pages - 'Jan Kowalski' is literally the Polish equivalent of 'John Smith,' so there were a lot of records - but I found the manifest! Here is Władysława with her three sons, Jan, Stanisław, and Josef, all listed with her surname of 'Kowalska.' And her father, Stanisław Gacki, is listed as next of kin, so that matches the information on her death certificate. Source Citation: Year: 1913; Arrival; Microfilm Serial: T715; Microfilm Roll: 2194; Line: 25; Page Number: 43. Source Information: Ancestry.com. New York, Passenger Lists, 1820-1957 [database on-line]. Provo, UT, USA: Ancestry.com Operations, Inc., 2010. Wait. Great-Grandpa Was Born WHERE?? When you are studying your family's history, some of the most exciting documents you can come across in your research are immigration-related papers: Ship manifests and applications for citizenship. Not only do they tell you exactly where and when your ancestors entered the country, but they also contain important information about where your ancestor was from, which is absolutely vital if you want to start researching family lines in other countries. Source Citation: Year: 1920; Census Place: Cleveland Ward 14, Cuyahoga, Ohio; Roll: T625_1366; Page: 15A; Enumeration District: 272; Image: 37. Source Information: Ancestry.com. 1920 United States Federal Census [database on-line]. Provo, UT, USA: Ancestry.com Operations Inc, 2010. Images reproduced by FamilySearch. I enjoyed solving this little mystery for myself, probably because it involved looking at maps, which I love to do. Trying to understand the history behind all these name and border changes was a little more difficult, but I would like to someday read a (good) history of Poland. And I intend to write more blog posts in the future about how historical events in Europe may have influenced my and my husband's ancestors to make the decision to immigrate to America.